Football season has just started, the World Series is almost here, and the Breeder's Cup is about to be upon us; what a great time of year for sports fans. Now I know most of you are saying, "woh woh woh, wait a second, Breeder's Cup? what's that?" So before you get too skeptical, hear me out. The Breeder's Cup is the Super Bowl or the World Series of horse racing. Every year in October the best thoroughbred's from around the world assemble at one of the many tracks that scatter the United States to compete. This year's Breeder's Cup is being hosted by Santa Anita Racetrack in Southern California. For the complete schedule you can visit the Official Breeder's Cup website. This year's Breeder's Cup is a little bit different than most though, it's biggest race, The Breeder's Cup Classic, features two of the best horses this sport has seen in years. I'm sure most of you have heard of the UPS sponsored horse named Big Brown that flirted with horse racing immortality in the Belmont Stakes this year. Big Brown failed in his attempt to win the Triple Crown this May, but has still had a phenomenal year for a thoroughbred. 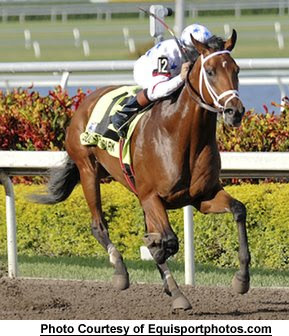 His counterpart, Curlin is the defending Horse of the Year, and won the Breeder's Cup Classic last year. Last week he became the richest horse in the history of the sport, by eclipsing the $10 million mark in career earnings. The two horses have made over $11 million dollars this year, and have won most all but one of their races each. So instead of tuning into another college football blowout this year, turn on the Breeder's Cup Classic, and witness a sport that dates back to the Roman Empire, but still provides the same thrill. If you are looking to watch horse racing this weekend, you can check out the schedule on the National Thoroughbred Racing Association (NTRA) website.